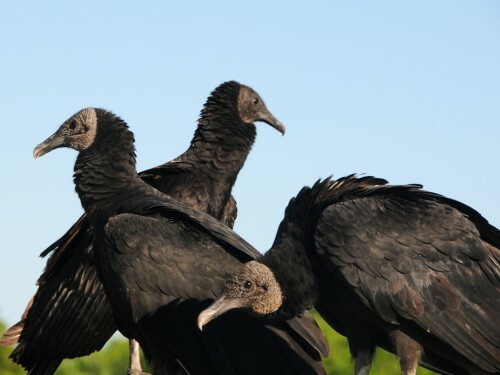 Tip 1: Managing black vulture damage in Ohio: Not only are they not very appealing in the looks department, but black vultures can also do some real damage both on-farm and off. Although these scavengers play an important role in the ecosystem, they can attack and kill calves, lambs, piglets and other weak animals. They can also damage homes, commercial buildings, vehicles, boats and tractors. The fact that they’re protected by the Migratory Bird Treaty Act, state laws and regulations, makes their management tricky. Homeowners and farmers alike must work with wildlife specialists on their control. Find out more from: Marne A. Titchenell, Ohio State wildlife program specialist, OSU Extension, School of Environment and Natural Resources, titchenell.4@osu.edu, 614-292-0402. Tip 3: Lake Erie algal bloom forecast on Thursday: ‘Tis the season to predict just how small or large algal blooms will be this summer. Media will be briefed on the latest calculations on July 12 at Lake Erie’s Stone Lab, part of the College of Food, Agricultural, and Environmental Sciences. Experts from the National Oceanic and Atmosphere Administration, Ohio Sea Grant and Stone Lab, and Heidelberg University will be guest speakers. Registration to attend has closed, but both the press and public can participate by webinar by registering at go.osu.edu/habs2018. Contact Jill Jentes, Ohio Sea Grant and Stone Laboratory, at jentes.1@osu.edu or 614-937-0072, for more information. 5 Stone Lab Guest Lecture, 7-9 p.m., Stone Lab, The Ohio State University, Put-in-Bay, Lake Erie. 7 p.m., research brief by Rachel Gabor, assistant professor, School of Environment and Natural Resources, 8 p.m., guest lecture by Jeff Sharp, director, SENR. Free admission. Requires ferry ride or own boat or air transportation to Put-in-Bay and $6 round-trip water taxi ride from Boardwalk Restaurant dock to Gibraltar Island at 6:30 p.m. or 7:30 p.m. Also can be viewed online. More information: go.osu.edu/CSu5. 7-8 Macro Photography Workshop, 10 a.m. to 3 p.m. both days in the Jack and Deb Miller Pavilion, Secrest Arboretum, Ohio Agricultural Research and Development Center (OARDC), 1680 Madison Ave., Wooster. Features an introduction to macro photography, field sessions and critiques. More information and a link to register: go.osu.edu/CVPd. OARDC is the research arm of CFAES. 10 Environmental Professionals Network breakfast program, “Wetlands, River and Restoration: A Walking Tour of the Lower Olentangy,” 7:15-11:30 a.m., meet at the Fawcett Event Center, 2400 Olentangy River Road, Columbus, for free shuttle bus ride to Wilma H. Shiermeier Olentangy River Wetland Research Park. Registration: $10; includes breakfast. More information and online registration: go.osu.edu/CVNN. 12 Identifying Summer Weeds, 8-10 a.m., Secrest Arboretum, Miller Pavilion, OARDC, 1680 Madison Ave., Wooster. Registration: $10 for arboretum members, $15 for nonmembers. More information: Gwen Zimmerly or Paul Snyder, 330-263-3761, or go.osu.edu/CSxX. 12 Lake Erie Algal Bloom Forecast, 11 a.m. to 1 p.m., Stone Lab, The Ohio State University, Put-in-Bay, Lake Erie. Annual NOAA summer forecast for Lake Erie harmful algal blooms. Nutrient loading projections, expert commentary and research updates will also be featured. Free. Also can be viewed online. More information: go.osu.edu/CSvJ. 12 Whiz Bang Science Show, 7-8:30 p.m., John Streeter Garden Amphitheater, Secrest Arboretum, OARDC, 1680 Madison Ave., Wooster. Free, fun science show for kids. Cancelled in case of bad weather. More information: go.osu.edu/CVPx. 13 Name That Tree, 9 a.m. to 3 p.m., The Ohio State University Mansfield campus, 100 Ovalwood Hall, 1760 University Drive, Mansfield. Workshop on identifying trees. Registration: $35; includes lunch and materials. More information: ohiowoods@osu.edu or 614-688-3421. 14 Ohio Sheep Day, Eastern Agricultural Research Station, 16870 Bond Ridge Road, Caldwell. Registration: $15 for Ohio Sheep Improvement Association members; $25 for nonmembers. Cost includes lunch. Memberships can be purchased during registration. More information: Roger High, 614-246-8299 or rhigh@ofbf.org. 14 Intensifying Pond Production of Fish, 9 a.m. to 4 p.m., Millcreek Township Hall, Millcreek Perch Farm, 10420 Watkins Road, Marysville. Registration: $50 for Ohio Aquaculture Association members; $75 for nonmembers. More information: Matthew Smith, 740-289-2071, ext. 121, or smith.11460@osu.edu. 16 Western Ohio Precision Agriculture Field Day, starts at 8 a.m., 9060 Versailles, Southeastern Road, Versailles. Free. More information: go.osu.edu/CVNQ. 18 Bee Lab Webinar, 9-10 a.m., featuring “Insect-Animal Husbandry: What You Do and Don’t Do Matters!” by Alex Zomchek, master beekeeping instructor. Join by using the “Guest Login” at go.osu.edu/theOSUbuzz at 8:55 a.m.
18 Western Agronomy Field Day, 9 a.m. to 3 p.m., Western Agricultural Research Station, 7721 S. Charleston Pike, South Charleston. Free admission; includes lunch. Participants must preregister by July 11. More information and online registration: go.osu.edu/CVNX. 19 Northeast Ohio Grape Field Day, 1-4:30 p.m., at the Ashtabula Agricultural Research Station, 2625 South Ridge Road East, Kingsville. Free and open to the public. More information: Andrew Kirk, 440-224-0273 or kirk.197@osu.edu. 19 Stone Lab Student Research Presentations, online starting at 6 p.m. Presentations by seven students participating in the Research Experience for Undergraduates program at Ohio State’s Stone Lab, Put-in-Bay, Lake Erie. More information: go.osu.edu/CSvN. 25 Summer Grafting Workshop, 8 a.m. to noon, Secrest Arboretum, Miller Pavilion, OARDC, 1680 Madison Ave., Wooster. Registration: $35 for arboretum members; $45 for nonmembers. More information: Paul Snyder, 330-263-3761 or snyder.1062@osu.edu, or go.osu.edu/CSxZ. 25 Manure Science Review 8:30 a.m. to 3:30 p.m., Watkins Farm, 18361 Township Road 90, Forest. More information: Mary Wicks, 330-202-3533, or wicks.14@osu.edu, or visit ocamm.osu.edu. 26 Muck Crops Field Day, 9 a.m. to noon at the Muck Crops Agricultural Research Station, 4875 State Route 103 South, Willard. More information: Bob Filbrun at filbrun.12@osu.edu or 419-935-1201. 26 Stone Lab Guest Lecture, 7-9 p.m., Stone Lab, The Ohio State University, Put-in-Bay, Lake Erie. 7 p.m. Research brief to be announced. 8 p.m. Guest lecture by Craig Butler, director, Ohio Environmental Protection Agency. Free admission. Requires ferry ride, own boat or air transportation to Put-in-Bay and $6 round-trip water taxi ride from Boardwalk Restaurant dock to Gibraltar Island at 6:30 p.m. or 7:30 p.m. Also can be viewed online. More information: go.osu.edu/CSvS. 2 Stone Lab Guest Lecture, 7-9 p.m., Stone Lab, The Ohio State University, Put-in-Bay, Lake Erie. 7 p.m., research brief, “Invasive Species Management and Research: Are We Working at the Same Scales?” by Jonathan Bossenbroek, professor of ecology, University of Toledo; 8 p.m., guest lecture by Rich Carter, executive administrator, Fish Management Group, Division of Wildlife, Ohio Department of Natural Resources. Requires ferry ride or own boat or air transportation to Put-in-Bay and $6 round-trip water taxi ride from Boardwalk Restaurant dock to Gibraltar Island at 6:30 p.m. or 7:30 p.m. Also can be viewed online. More information: go.osu.edu/CVNZ. 7 Turfgrass Research and Technology Field Day, 8:30 a.m. to 3 p.m., Ohio Turfgrass Foundation (OTF) Research and Education Facility, 2490 Carmack Road, The Ohio State University, Columbus. Registration, which includes lunch, is $20 for OTF members and $40 for nonmembers. More information and online registration: go.osu.edu/CVNb. 9 Ohio Lawn Care Association (OCLA) Summer Seminar, 7:30 a.m. to 3:45 p.m., OTF Research and Education Facility, 2490 Carmack Road, The Ohio State University, Columbus. Registration for OLCA members: $50 for first preregistrant by Aug. 3; $40 for each additional preregistrant from the same company by Aug. 3; $55 per registrant on site or after Aug. 3. Registration for nonmembers: $85 per participant by Aug. 3; $100 per participant on site or after Aug. 3. More information and online registration: go.osu.edu/CVNd. 9 Composting in Ohio: A Tour of the Industry, 9 a.m. to 3 p.m., featuring tours of the Allen-Oakwood Correctional Facility Compost Complex in Lima and Andre Farms Composting in Wauseon. Meet at Allen-Oakwood Correctional Facility, 2338 North West St., Lima; or ride in free van leaving from OARDC, 1680 Madison Ave., Wooster. Registration is $40, or $20 for students; includes lunch. More information: wicks.14@osu.edu, 330-202-3533, or go.osu.edu/CVNg. 9 Whiz Bang Science Show, 7-8:30 p.m., John Streeter Garden Amphitheater, Secrest Arboretum, OARDC, 1680 Madison Ave., Wooster. Free, fun science show for kids. Cancelled in case of bad weather. More information: go.osu.edu/CVPx. 11 Guided Bird Walk, 9-11 a.m., Seaman Orientation Plaza, Secrest Arboretum, OARDC, 1680 Madison Ave., Wooster. Free. More information: go.osu.edu/CVPs.